Drawcord Bivy, in the wild. 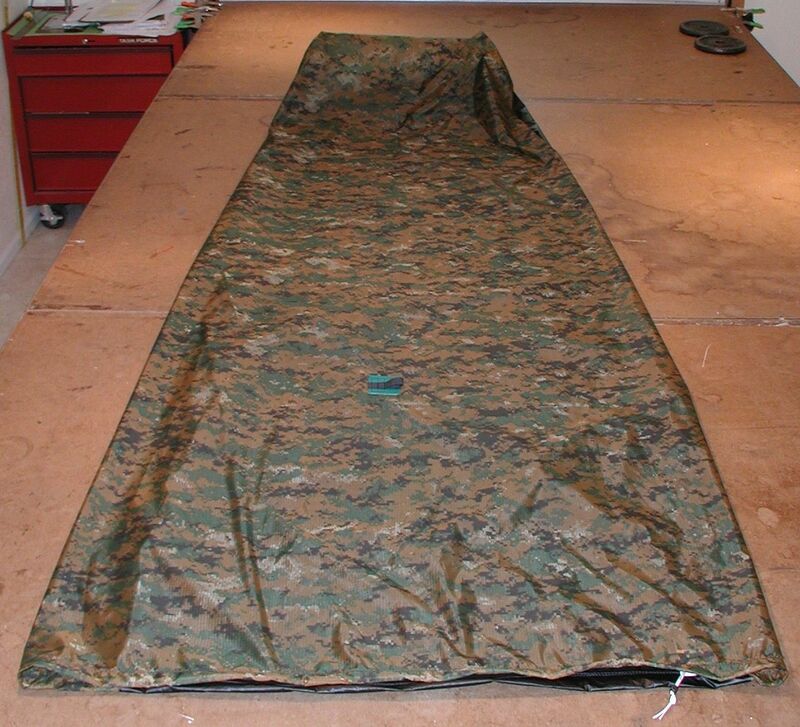 Using some pre quilted hollow fiber insulation and some Camo surplus nylon, sewed up a half bag. Fits over my down bag and ties to the side loops so it won’t slip off in the night. Allows extra insulation and weather resistance with minimal weight. My down jacket can serve as insulation on the top half. 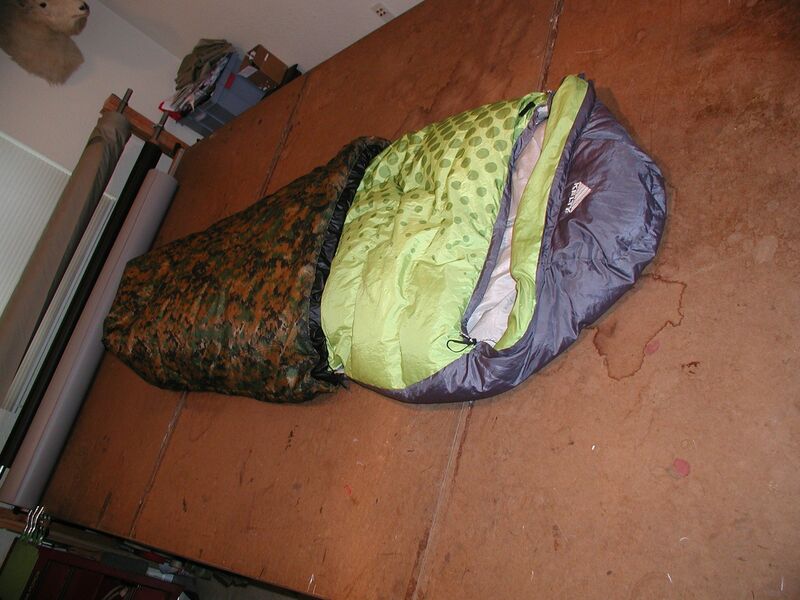 Keeps wind, bugs, dirt off you and off of your nice down sleeping bag. 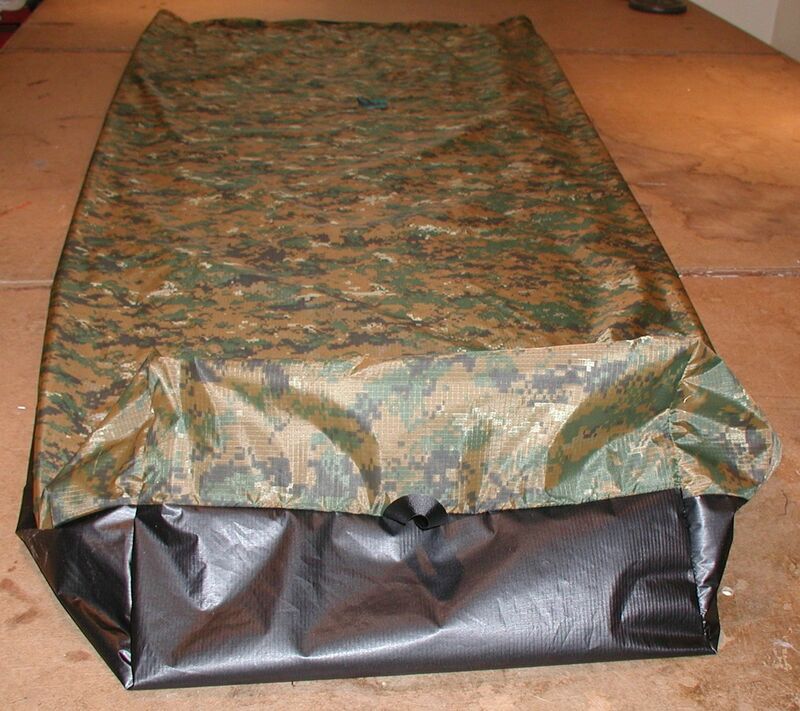 Protects your inflatable sleeping pad and you from the damp ground. Great for Scout troops and schools, and those hard on equipment light, simple, inexpensive. Super breathable top of 1.1 oz ripstop nylon. Waterproof bottom of silicone coated 1.1 oz ripstop nylon. 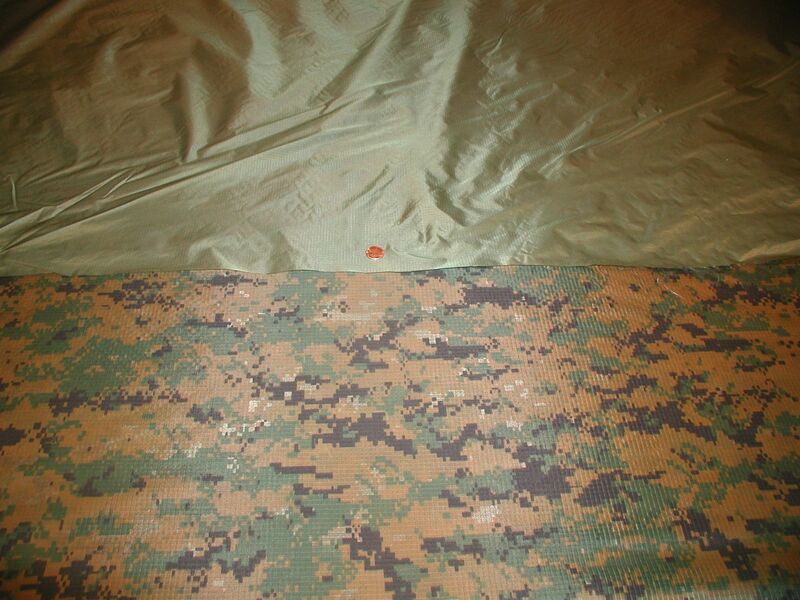 Olive or Marpat digital woodland camo top, black bottom. Drawcord closure at top. No zipper to wear out, you can draw it around your face to keep out drafts (especially nice for quilt users). 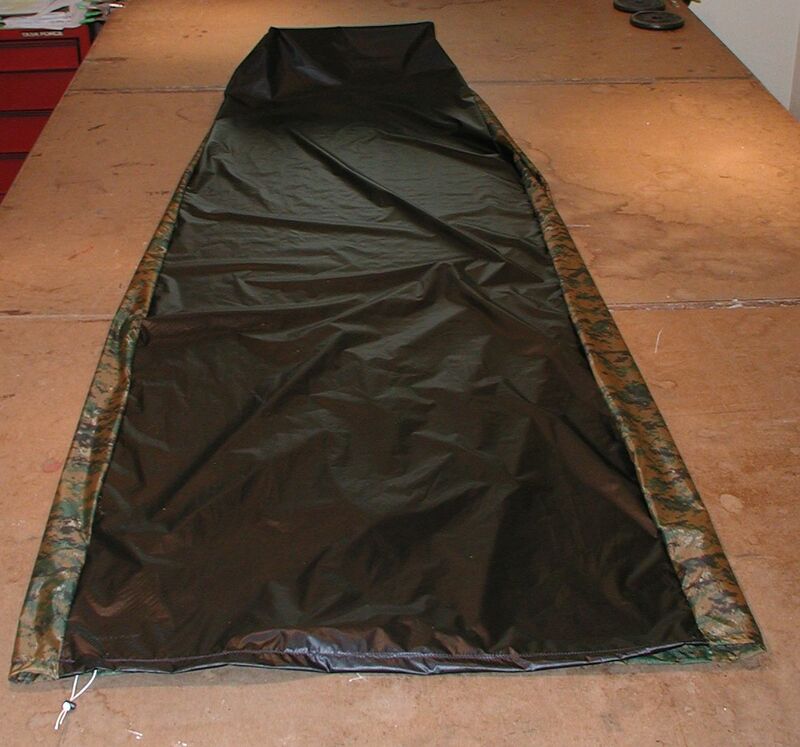 7.15 ounces in weight (7.4 with included tiny stuffsack) Roomy girth of 72″ from head to elbows, then tapering to 26 over it’s 85″ length (from opened top to heel). Drawn closed measures 80″ to heels. Squared footbox is 10″ high. This gives a 6 ft tall person 8″ total extra for your bag to loft on either end or makes it useable by taller folks in warmer weather. Stake out loop at bottom to keep it in place when you are out of the bag. Reinforced tie out in middle of the top panel. Tie it up to keep the fabric off your upper body for more ventilation or bug resistance. Made in the USA of USA fabric. Just $55 with free shipping in the US. On many Outward Bound courses, toilet paper was left at home and local natural items substituted to cut down on backcountry environmental impact. In some desert environs, where the most popular substitutes of snow or vegetation weren’t available, toilet paper was carried and then burned or carried out. It should be obvious (but unfortunately not to all) that burning toilet paper is a great hazard in forest fire conditions, so carrying it out was then prefered. In some damper times and places, burning works well. Here is what I like to bring (in addition to using snow and other substitutes). Weighs 23 grams and is enough for 2 weeks. 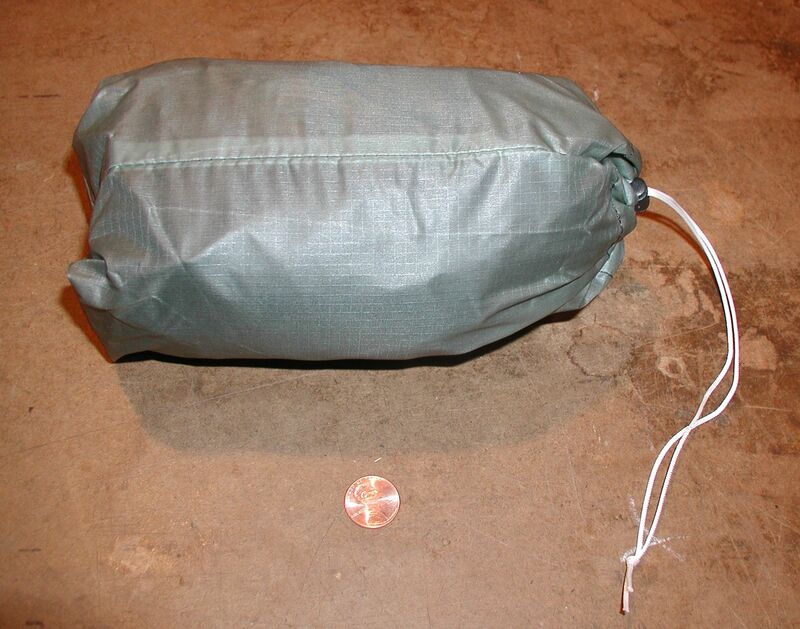 Tiny cuben fiber stuffsack lined with thin plastic for water tightness. I cut a 6″ section of the jute cord and fuzz it up and use it to catch a spark from a mish metal flint which then catches the paper towel and with care will burn the whole thing to ash.